Looks like even with the stimulus plan, job losses are still continuing but at a slower rate than last quarter. The unemployment numbers go to 9.5%, meaning 467,000 more people lost their job. Even government related jobs were cut by 52,000. I still think government related jobs are the best way to go in this recession. The economy is still staying resilient. People will continue to buy things and you have to stay perseverant. Keep up with your marketable job skills and continue to follow your passion. When you first begin your job search, there is the tedious process of posting your resume to every single online job site. Why do we do this? 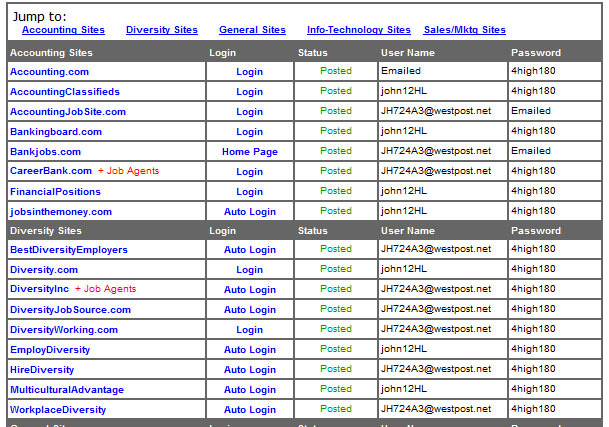 Each job site has different job listings and you want to make sure your resume is available for all employers to see. By increasing your resume presence, you increase your chances of getting a job. The big problem is the time involved in doing so. It could take anywhere from 3 to 4 days of nonstop posting to get this done. That is over 80 hours of resume posting. Instead of spending 80 hours, I can take 5 minutes to post one resume and let Resume Rabbit send it out to 70+ job sites. It was a 3 step process for me. First step is your basic email and user name registration. Next step is more detailed and ask for name and address. This is also the time for you to post your text resume and specific which sites you want the resume posted. You can choose part time, full time and intern positions. Make sure to figure out the job position you are seeking so this process can be completely in a very short amount of time. The final process is the billing. The price is $59.95. They say the resume will be exposed to over 1.5 million employers and recruiters. 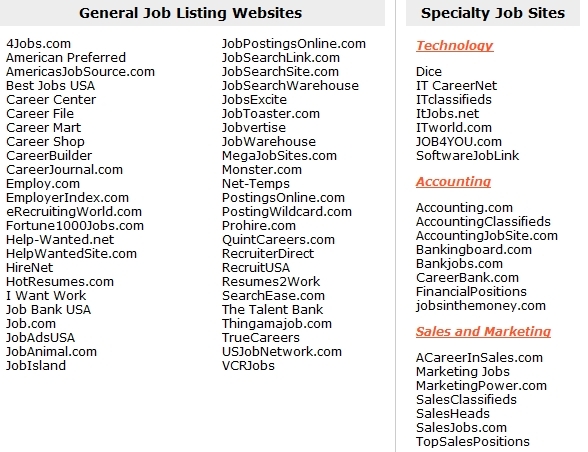 These are just a few of the job sites where they will post your resume. The hours I saved by doing this automatically are well worth the $59.95 price tag. I rationalize it by saying I spent less than $1 per site. Resume Rabbit also keeps everything manageable with logins and password. 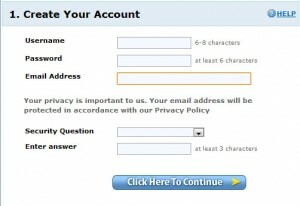 I know I would have hard time tracking passwords and login information. I don’t have to go to every single job site to login and check my status. Resume Rabbit keeps things centralized so I can access their site for everything. Additionally, each time my resume gets posted to a job site, the information is updated. Here is a sample of their centralized resume report each time a resume gets posted. How applicable would your job skills be if they were used outside of your current profession? This was not a question I gave too much thought until I read a job loss article about how a 200,000 Wall Street crude oil trader lost his job and is now working for 25,000 a year in a restaurant. Mr. 200,000 might be finding it hard to translate his previous job skills into something usable. He should be thinking about how he can show marketable job skills on his resume. What does an crude oil trader do anyway, besides the obvious, trading crude oil. It’s hard not to belittle his previous occupational skills. Did he yell all day and wrestle through crowds of people to fulfill trade orders? There might be some communication skills there. You do not simply lose all your job transferable skills. A lot of finance jobs were unstable anyhow. The jobs were created out of a false money bubble built on bad loans and inflated housing prices. I do not feel any sympathy for him, considering he never tried to walk in other people’s shoes. It was a hard reality at first… I used to see unemployed people and think they were lazy, that it was all on them. Now it’s happened to me. He worked hard from runner to trader but forgot what got him there. Maybe if Mr. 200k worked on transferable job skills, he wouldn’t be in such a predicament. Here is a list of skills that should be on displayed on everyone’s resume. Writing skills – Don’t write that you can write. That would be too obvious and redundant. Rather put on your resume, some projects that involved writing such as business plans, contracts or articles you wrote for your company. Sales – If you had a record year selling a particular product, put that on your resume. If your company or store saw record profits, put that amount onto your resume. Customer service – Discuss how you interacted with your clients. Was there a particular request that went above and beyond normal customer service? The more obscure the request, the better story you tell to your future employer. Technical skills – Transferring technical skills is probably the easiest things to do. Often times, you can put down the number of programming languages on your resume and that is it. However, the list is growing for outsourced workers with the same technical skills if not better. How can you compete with them? The answer and difference is in how you were able to translate these technical skills to others on the same project and to your superiors and clients. Someone who is able to communicate the complex and complicated technical aspect of a project will often be the one who is leading the task. Separate yourself from just the technical skills and mix in a bit of the other marketable and transferable job skills. Interpersonal skills – Did you work in a group and had to organize and assign roles? If you are not respected within the group, you usually won’t get the same commitment and dedication to a specific task. How did you overcome those challenges and what interpersonal skills did you use? Communications skills – Have you ever had to explain a highly technical project to someone outside of the team? Being able to express yourself in a clear and basic manner to someone new to the project is very marketable. I cannot express the countless times, I heard a presentation where people left more confused than informed. If you are lacking marketable job skills to put on your resume, go and start your own project or volunteer in a field of your interest. Just follow the list of skills and make sure they are in your arsenal when you are job searching.